All date stamps guaranteed to last at least ten years! I purchased two stamps. Both were made perfectly to my specs and work well and reliably. I am in need of one more now as a result of a procedure change at work and will no doubt be returning for the third. I ordered a dual color stamp and could not be happier. Very clear stamp when used! Will use the vendor again and recommend to others. Five stars from me! I bought a few things from RubberStamps.net and all have met my standards. 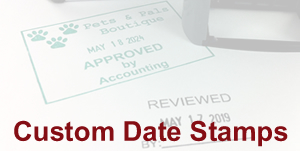 The best part about this website is customizing your own wording, font and color on the date stampers. Delivery was timely as well. I bought two types, a business stamp with address information and a expiration date stamp, they both work great. Thanks for the quick service. I bought several different stamps and got exactly what I wanted. I have already recommended this company to 4 other admin staff for our building. With www.rubberstamps.net, rest assured your custom stamps will be correct the first time. Don't compromise on quality; see the www.rubberstamps.net difference! We are proud to offer quality custom stamps at the best possible price. We continuously strive to provide customers with outstanding instant pricing through our easy-to-use website. Our top-quality 1000dpi laser etching process gives each order a long lasting and uniquely precise impression. 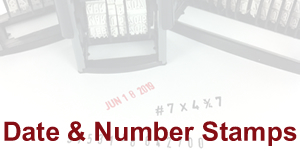 www.rubberstamps.net features some of the fastest custom stamp engraving times found online; 97% of orders ship in 24 hours! Local pickup is available in the Quad-Cities area. All of our personalized stamps are made in Bettendorf, Iowa. 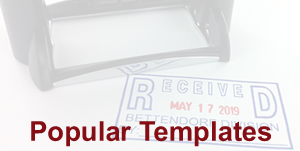 Skilled craftspeople carefully assemble and test each custom rubber stamp for a quality impression. The possibilities are endless: type and customize text, upload a logo, signatures, calligraphy and more! Have a question? We love to help! Call customer service and talk to a live stamp expert from 9:00am - 5:00pm CST, Monday - Friday. Protecting the environment, our employees and customers is one of our chief concerns. We use a natural red rubber and self-inking stamp bodies contain up to 65% post-consumer recycled plastic.